Yes, most students benefit from moderately engaging their gluteus maximus in Upward Bow. Your glutes extend your hip joint—which is what gives you the ability to lift into the pose. I understand why some teachers have concerns about using the glutes in this posture, so let me give you three conditions to ensure that engaging your gluteus maximus is beneficial: 1) Focus on engaging the lower part of the gluteus maximus near your hamstring attachments. 2) Simultaneously engage your adductors (inner leg muscles) so that your thighs don’t externally rotate when your glutes kick in. 3) Don’t engage your gluteus maximus so intensely that the contraction pushes your pelvis too far up into the posture. This can hyperextend your lower back and produce excessive compression. To summarize: a little bit of firmness without going crazy is a very good idea. The most important parts of your body to warm up for Upward Bow are your quads and hip flexors. Several Low Lunge Sun Salutations, Low Lunge Quad Stretch, Supta Virasana and King Arthur’s Pose work best. If you’re unfamiliar with King Arthur’s Pose, here’s a tutorial. To warm your spine, try a simple progression of backbends that include Cobra Pose, Bow Pose (on your belly), and Bridge Bose. Shoulder openers like Gomukhasana and Garudasana help prepare the upper body for this backbend. If Handstand is part of your repertoire, include it in your preparations. 1. Lie back with your feet hip width and your hands slightly wider than your shoulders. 2. Take a slow, deep, “everything is going to be alright” breath. 3. Gently press your lower back into the floor and lift your tailbone. Initiating the pose this way will help your pelvis rotate the correct direction in the pose and minimize compression in your lower back. Continue lifting your up through your tailbone as you proceed through the following instructions. 4. As you inhale, press down through your hands and feet, lift your body slightly off the floor, and place the top of your head on floor. Bring awaress to your feet and press down through your big toes and inner heels—this will help minimize the tendency for the feet to splay outward in the pose. Take a moment to hug your elbows toward each other so that your elbows stay shoulder-width apart. 5. As you exhale, press your hands and feet more firmly into the floor and use this strength to raise your body into the posture. 6. Now that you’re in Upward Bow, check out the infographic above and refine your pose. 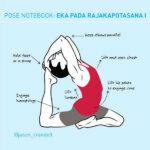 Give yourself 3 to 5 breaths here and repeat the pose a few times. 7. It’s tempting to quickly bail out of the pose as soon as you’re done with it. Instead, practice lowering slowly to the floor. In fact, try to lower down one vertebra at a time. Slowing your descent in this posture will strenghten your shoulders, strengthen you abdominal core, and help decompress your lower back. 8. Take a moment or two after the pose and savor the sensations of your body. If you’re like me, your favorite part of Upward Bow is the moment you’re done. IF I CAN’T DO UPWARD BOW YET, WHAT SHOULD I DO INSTEAD? There are many, many reasons that Upward Bow can be innaccessible. If you’re unable to do Upward Bow, it may be due to lack of mobility or lack of strength. It’s also possible that you have discomfort in your wrists, shoulders, or knees that’s holding you back. Your best bet is to do a combination of postures that address all of these factors. Practice Cobra, Bridge Pose, and Reclined Backbend over a block for your spine and shoulders; practice Low Lunge Sun Salutations and King Arthur’s Pose to open your shoulders; and, practice Handstand (or Half-Handstand with your feet at the wall) to develop strength. If your wrists are uncomfortable in Handstand/Half-Handstand, practice Dolphin Pose instead. WHICH MUSCLES DOES URDHVA DHANURASANA STRENGTHEN? Your hamstrings and gluteus maximus work together to extend your hips. Find the sweet spot where you’re using just enough gluteal muscle to exend your hip without gripping so much that you externally rotate your femurs. Your adductors are working to balance the effort of your gluteus maximus. By engaging your adductors, especially your adductor magnus, you will help keep your thighs parallel in the pose. All of your spinal muscles work to extend your spine. Your external rotators—infraspinatus, teres minor, and posterior deltoids—all engage to keep your upper arms externally rotated in the pose; your deltoids work to flex your shoulders; your serratus anterior laterally rotates your shoulder blades. Your triceps contract to straighten your arms. WHICH MUSCLES DOES URDHVA DHANURASANA STRETCH? Upward Bow stretches all the anterior muscles of your body. Here’s a more detailed look. All of your quadriceps stretch in Upward Bow Pose. Of course, these muscles also contract to help straighten your knees which makes it more challenging for these muscles to simultaneously stretch. If you’re using your hamstrings, glutes, and adductors properly to support the weight of your pelvis, your quads don’t have to work as hard and they will stretch more effectively. Your hip flexors—iliopsoas and rectus femoris—stretch in Upward Bow. Your abdominals stretch—especially your rectus abdominis. You may also get a mild stretch in your intercostal muscles. Your latissimus dorsi, pectoralis major, and pectoralis minor all stretch in Upward Bow. 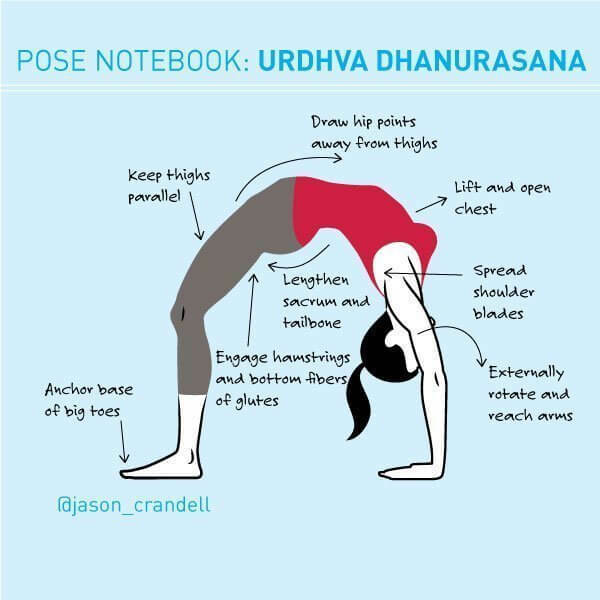 You can find a fully-illustrated, 16-pose Urdvha Dhanurasana sequence here. Thanks for your message, Leigh Ann! I’d love for you to join our online anatomy training when you’re ready! Hi Jason! As a yoga teacher, I find this to be an informative post with a lot of helpful tips. I have a YouTube yoga channel and I’m filming a short video tutorial on wheel pose. Would it be OK to reference this post in my video? I will acknowledge your blog and include a link to your website. I’ve learned a lot from your online work and I would love to share your teachings with my small audience. Thank you for your time and I hope to hear from you soon. Hi Maris, This is Andrea. Certainly, we’d be happy for you to reference this post in your video! Thank you for asking and best wishes! Great post! Recently a student asked me why he shouldn’t turn the feet out, it’s the only way he can get up into the pose. I’ve been taught that you feet the feet parallel to reduce torque of the knee and allow for proper engagement of the glutes but if there another reason? Absolutely wonderful! I have been teaching for two years and am so happy to have found you both through YogaGlo! Thanks for always leading the most inspirational and realistic classes. This is a great question that you and Kristy have asked. First, I think there are situations in which neutral thighs–or, even externally rotated thighs–are permissible in backbends. So, I want to acknowledge that there are occasionally exceptions to the rule of internally rotating your thigh bones. Now, the primary reason to internally rotate your thighs is because internally rotating your thighs brings your pelvis into a slightly anteriorly rotated position. This position allows for the L5 and Sacral Facets to couple. These facet joints, when coupled, provide stability to the lumbar and initiate the natural curve of the lumbar spine. Now, to make matters complicated…. Internally rotating the femurs helps to stabilize the lumbar by bringing the pelvis into a slightly anteriorly rotated position, thus coupling the sacrum and L5. But, as you continue the backbend, you want to extend your hips. Meaning, you want to rotate the pelvis back over your femurs. So, you’re combining actions. You’re internally rotating the femurs to set the position of the lumbar, before focusing on rocking the pelvis backward over the femurs into extension. Essentially, the internally rotating the femurs while extending the hip joint in backbends creates a balanced action for the lumbar.